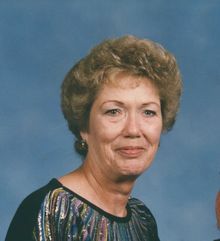 Arlene Estelle Hester, 85, of Dublin passed away on Wednesday, February 6, 2019. She was preceded in death by her parents: Carvel Hester and Ethel Dowless Hester, two brothers Hafford and Myron Hester, one sister: Glenda Pritchard, two daughters: Sharon Britt, Vickie Britt and one son Tommy Britt. Arlene is survived by one sister: Ida Vann of Dublin and several grandchildren. A graveside service will be held on Friday, February 8, 2019 at 1:00 pm in Singletary United Methodist Church Cemetery in Dublin officiated by Rev. Alan Byerly. The family will receive friends from 10:00 am -12:00 pm prior to the service on Friday, February 8, 2019 at Bladen Gaskins Funeral Home in Elizabethtown.